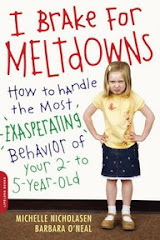 I Brake For Meltdowns: Down, Mama, Down! Helping a child do a school project is an exercise in self-restraint. I was asked to help, that's true. But I'm struggling to figure out what kind of help I should be giving. If the advice is not quite right, I get yelled at or cut off. Tears may flow. How can I sit back and watch my daughter apply words to the poster that are too small and crushed together to read from a distance. Should I even care about this? I kinda feel that I should point out how it appears to others. But this might go over as a criticism. And then there's spelling. Does it matter if saliva looks like this "sliva?" What about all those extra words she wants to cram in that are unnecessary and could save space if eliminated? "The fennec fox likes to eat a diet of..." I can't seem to turn off my editing instincts but I probably should. I'm not worried about grades, but about what I'm supposed to be teaching her. Maybe teaching is the wrong idea altogether. By the way, fennec foxes are these totally adorable little foxes with huge ears who live in the Sahara desert. http://www.fennecfox.com/. Was that too many words?